Should death be defined in strictly biological terms — as the body’s failure to maintain integrated functioning of respiration, blood circulation, and neurological activity? Should death be declared on the basis of severe neurological injury even when biological functions remain intact? Or is it essentially a social construct that should be defined in different ways? These are among the wide-ranging questions explored in a new special report, (“Defining Death: Organ Transplantation and the Fifty-Year Legacy of the Harvard Report on Brain Death,”) published with the current issue of the Hastings Center Report. The special report is a collaboration between The Hastings Center and the Center for Bioethics at Harvard Medical School. Editors are (Robert D. Truog), the Frances Glessner Lee professor of medical ethics, anaesthesiology & pediatrics and director of the Center for Bioethics at Harvard Medical School; (Nancy Berlinger), a research scholar at The Hastings Center; Rachel L. Zacharias, a student at the University of Pennsylvania Law School and a former project manager and research assistant at The Hastings Center; and (Mildred Z. Solomon), president of The Hastings Center. Are brain-dead organ donors dead? (“A Conceptual Justification for Brain Death”) by James Bernat, emeritus professor of medicine and neurology at the Geisel School of Medicine at Dartmouth, upholds the longstanding view that brain death quickly leads to the disintegration of the body, regardless of medical support. But (“Brain Death: A Conclusion in Search of a Justification”) by D. Alan Shewmon, emeritus professor of pediatrics and neurology at the David Geffen School of Medicine at UCLA, discusses several cases in which the bodies of patients pronounced brain dead did not “disintegrate” but were maintained by mechanical ventilation and tube feeding. (“DCDD Donors Are Not Dead”) by Ari Joffe, clinical professor in the department of pediatrics at the University of Alberta, argues that a subset of organ donors – those whose death is declared five minutes after the onset of pulselessness – are not dead because their condition could be reversed with medical intervention. Ethical conundrums: saving patients vs. saving organs. Potential organ donors who have undergone unexpected cardiac arrest outside of the hospital pose ethical challenges because their preferences concerning life-sustaining interventions and concerning organ donation may be unknown. When a patient’s chances of survival and recovery are extremely uncertain, first responders have a limited window of opportunity to act to preserve potentially viable organs. In some cases where organ preservation protocols were initiated after CPR failed, patients have recovered to some degree. (“Uncontrolled DCD: When Should We Stop Trying to Save the Patient and Focus on Saving the Organs?”) by Iván Ortega-Deballon, associate professor of health law and medical ethics and resuscitation at the Universidad de Alcalá in Spain, and David Rodríguez-Arias, Ramón y Cajal researcher of moral philosophy and bioethics in the philosophy department at the Universidad de Granada in Spain, examines whether current protocols prematurely consider as potential donors patients who have some chance of meaningful survival. They propose a pathway for first responders to uphold the best interests of patients even as they are being assessed and treated as potential donors. The future of organ transplantation. Two essays explore ethical questions associated with using pigs and other animals as organ donors for humans: (“The Other Animals of Transplant’s Future”) by Leslie A. Sharp, the Barbara Chamberlain and Helen Chamberlain Josefsberg ’30 chair in anthropology at Barnard College, and (“Bodies in Transition: Ethics in Xenotransplantation Research”) by Sheila Jasanoff, Pforzheimer professor of science and technology studies at Harvard University’s John F. Kennedy School of Government. The case of Jahi McMath. The concept of brain death was prominent in conflicts arising after McMath, an African-American teenager, was declared brain dead in a California hospital in 2013 after complications from elective surgery. Rejecting this determination, her family moved her to New Jersey, whose brain death statute includes a religious exemption and where a patient covered by this exemption can be enrolled in Medicaid to pay for long-term care. For nearly four years, McMath was kept biologically alive, until she was declared dead from cardiac arrest in New Jersey in 2018. Three essays explore the medical, ethical, and social questions that the case raised and reconsider the situation of Jahi McMath and her family in light of recent findings on the health consequences of implicit bias: (“Lessons from the Case of Jahi McMath”) by Robert D. Truog; (“The Case of Jahi McMath: A Neurologist’s View”) by D. Alan Shewmon; and (“Revisiting Death: Implicit Bias and the Case of Jahi McMath”) by Michele Goodwin, a chancellor’s professor at University of California, Irvine, and the founding director for the Center for Biotechnology and Global Health Policy. The special report, funded by the Boger Initiative for the Wise Use of Emerging Technologies at The Hastings Center, originated from presentations given at a 2018 conference at the Center for Bioethics at Harvard Medical School. 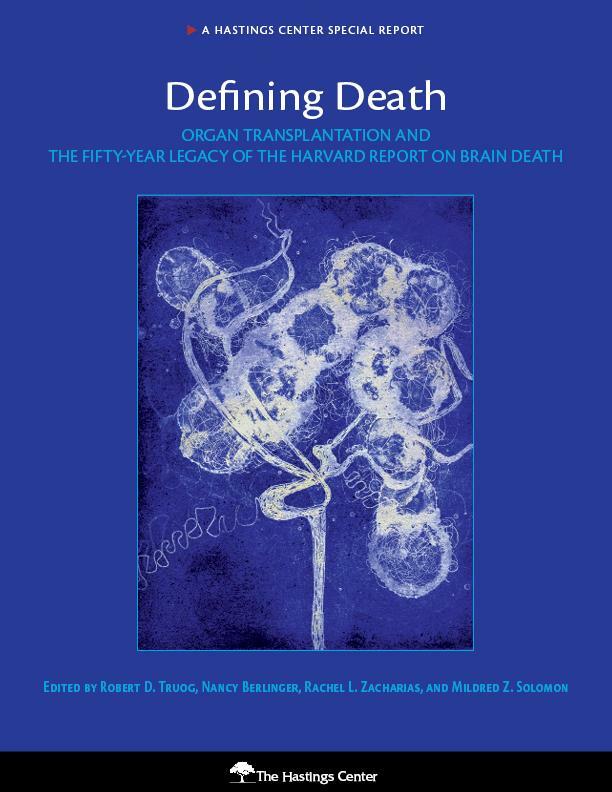 The full text of the report, Defining Death: Organ Transplantation and the Fifty-Year Legacy of the Harvard Report on Brain Death, can be found (here).